Third grade hit our home with a thud. Bonnie, our oldest daughter of three, found out one painful day that not all girls were nice girls. In fact, some were downright rude. Someone in her class had started an exclusive ‘club’ and Bonnie wasn’t on the roster. Ouch! It was so painful to watch her experience that rejection. As her mom, I knew that was only the beginning of the relational drama likely to unfold, especially with Junior High right around the corner. So how could I help her through this not-so-nice-experience and how could we turn things around? With Summer approaching, we decided to create our own club — and invite ALL the girls — even the exclusive ones! We named our club ‘The Summer Fun Son Club’ and sent a flyer home for the parents. The families were not all Christian families — so we wanted them to be aware that although fun was the main purpose of our club, Jesus was the heart behind what we were doing and He would be mentioned. The girls and I took time planning out the six fun activities we wanted to include for our weekly club meetings. During each meeting we included a craft or taught a skill, we played sports, ate fun food and ended with a Bible story. One week we even had the girls bring the ingredients to prepare a family dinner, and they all learned how to make meatloaf. It was hilarious to watch the girls mixing the hamburger, spices and tomato sauce with their bare hands! Another week we set up a simple obstacle course in the front yard, in honor of the Olympics, using old tires and sawhorses. We also did a neighborhood scavenger hunt, made ‘Good News’ bracelets, played Badminton, and spent an afternoon on the slip ’n slide. Another special activity was collecting rolls of newsprint from the local newspaper so that each girl could make a silhouette of her full length body. We concluded that activity with a devotional on how we’re made in God’s image. Each week’s activities were simple and entertaining, yet very meaningful. Not every girl came each time, but the six weeks served their intended purpose: grand fun, inclusivity, minimal preparation and financial investment, and sharing Jesus. As an added bonus — our daughters learned how to host a great party — as well as the value of including everyone! There’s still time if you want to do your own Summer Fun Club! Work to your strengths! If you read aloud well, read to the kids; if you bake well, teach the kids how to make banana bread or cupcakes; if you’re great at sewing, teach the kids how to sew a simple project. Think through areas of your own giftings or talents where you can provide great direction or encouragement. Accept help if it’s offered. You don’t have to do it all alone. Sometimes a mom may even ask to pitch in just to watch! Find an age-appropriate Bible storybook with pictures. Our girls loved Charles Swindoll’s Paw Paw Chuck’s Big Ideas in the Bible. Pray with your own children for the kids who will be participating and pray that the time spent in your home will be used to demonstrate Jesus’s love for them. What an awesome idea to teach hospitality to our children and/or grandchildren. When my now adult daughter was in Girl Scouts, I would have her troop over and teach them how to make Welsh Cakes as part of them working on one of their badges. I bet they loved that, Helena. Thank you! I love this Sue! I’m not sure how to implement it yet, but I think it’s a great idea. You’ve got my wheels turning! That’s great. This was a very spontaneous thing when I did it – maybe God knew if I spent too much time on it, it would scare me off! Hope you plunge in! Sue is a very good teacher as well. Our youngest son had Senior English and she was good. We have heard her speak about Papua New Guinea and how she walked barefoot because of the mud was every where. So she needs to include this part of her jobs that she does in Christ name. 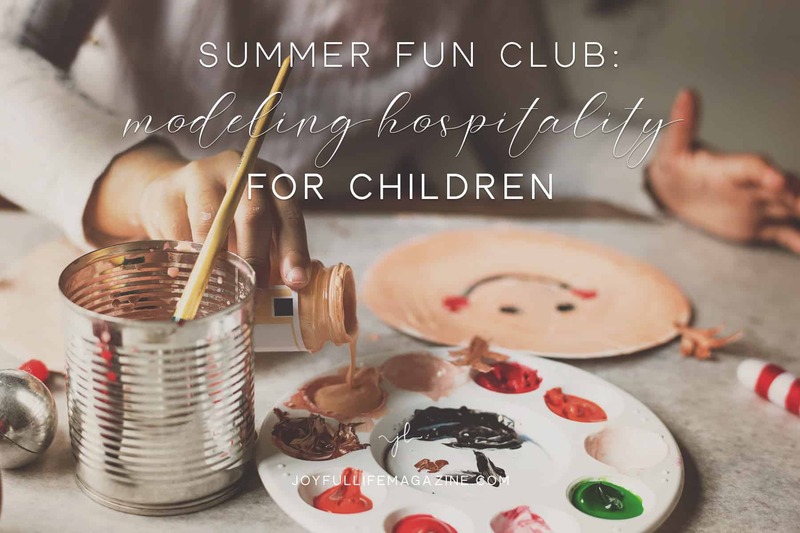 What a wonderful way to share by being the image of Christ as you have fun, prepare meals, do crafts, all the good stuff of being a kid, yet also being hospitable in the Name of Jesus. Thanks, Linda – it was worth all the effort for all those reasons!